Reading a pregnancy advice book. The pregnant woman in the picture is looking at what appears to be the 1990 edition of Nilsson’s bestseller, opened at pages 118 and 119. This uncommissioned photograph is part of a series showing everyday activities of pregnant women, thus implicitly acknowledging the impact of Nilsson’s work in popular culture. It was taken in London in the early 1990s by the British photographer Anthea Sieveking, a specialist in the photography of babies, children and especially childbirth. Her vivid, naturalistic photographs of birthing women and newborns are included in books by Janet Balaskas,the pioneer of the Active Birth Movement that advocated free movement in labour and childbearing in an upright position. Pregnancy advice books. Illustrated books informing mothers-to-be about embryology have been in circulation since the early twentieth century. But none was as popular as Nilsson’s A child is born, a bestseller in numerous languages (Swedish edition, 1965; U.S. edition, 1966). In contrast to Life, where embryos floated alone, these books placed development firmly within the female body and as an addition to a heterosexual couple. In the following decades, images of aborted embryos have remained the cornerstone of cutting-edge books on pregnancy. An example is From conception to birth (2002) by anatomical artist Alexander Tsiaras and writer Barry Werth. That book combined images of early Carnegie collection embryos with high-tech scans of the uterine contents. 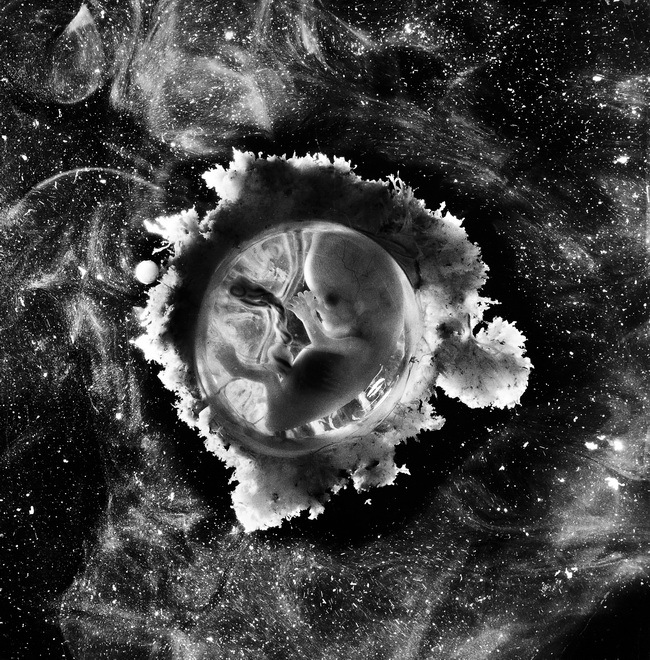 In the 1960s embryo and fetus were shaped in the public imagination by magazine use of images from the Swedish photographer Lennart Nilsson. 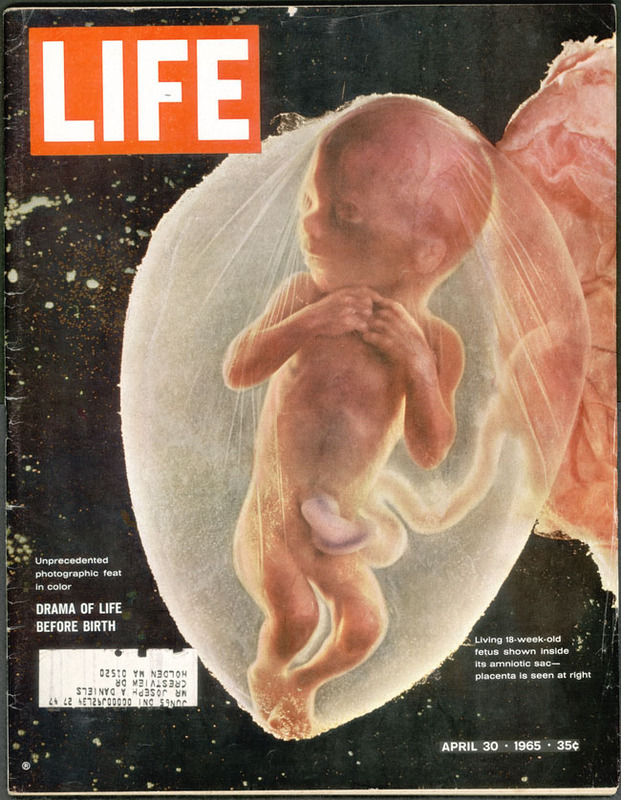 In 1965, Life magazine published a story about human intrauterine development, centred on Nilsson’s memorable images. These were not the first embryo photographs in the press or even the first to show a developmental series. 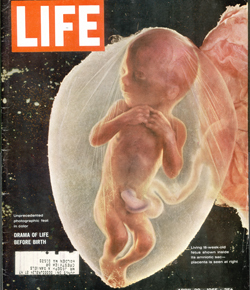 In 1950, Life had itself published a set showing development between the third and thirteenth weeks. But it was Nilsson’s images that became twentieth-century icons. In contrast to the blurry black-and-white ultrasound scans, they shared in the explosion of colour in print and on screen. They also came at a critical time: more monitoring of pregnancy, more human reproduction taught in school, abortion-law reform on the agenda and high interest in science. ‘Drama of life before birth’. The cover of Life magazine features a Nilsson photograph and advertises an ‘Unprecedented photographic feat in color’. At the time of publication, his long career in photo-journalism already covered a broad range of themes, from war to celebrities and the natural world— even embryos. But it was this cover and the pregnancy advice book published at the same time that made him internationally famous. In 1990, Life revisited Nilsson’s embryonic imagery with a new photo-essay on ‘The first days of creation’, advertised on the front page as ‘The first pictures ever of how life begins’. It showed development from a spermatozoon burying itself into an egg cell to the child-like 11-week embryo. Cover of Life, vol. 58, no. 17, 30 April 1965. 35 x 27 cm. Life magazine and Lennart Nilsson Photography AB. Spaceman. This photo of an 11-week, 2-inch fetus is captioned: ‘Like an astronaut in his capsule the fetus floats in its amniotic sac with the villi of the placenta around it like a radiant wreath. 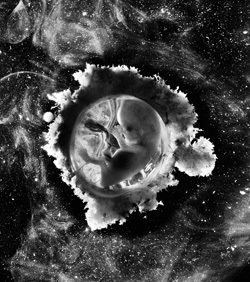 The nebulae and constellations in this firmament are formed by cells from the maternal blood and salt crystals in the fetal waters.’ ‘Spaceman embryo’ resonated with an audience living in the shadow of the Cold War space race. The cyborg Star Child of Stanley Kubrick’s Odyssey 2001 (1968) resembled Nilsson’s embryos. And Nilsson’s images even travelled into space: two were sent with the Voyager spacecraft in 1977 on the ‘Golden record’, a collection of sounds and images representing life and culture on earth. Originally published in A child is born, UK edition, London: Allen Lane, the Penguin Press, 1967, pp. 86–7.